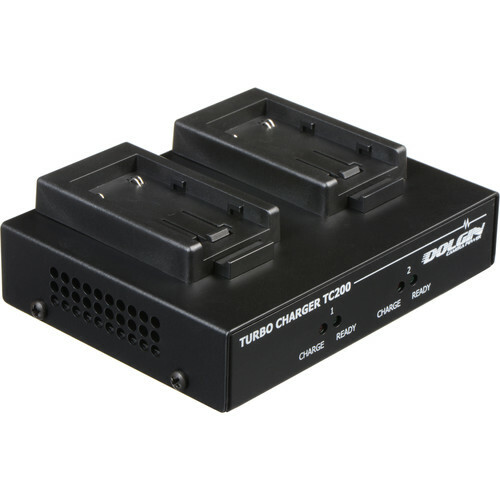 The TC200-JVC-BN-VF823 Battery Charger from Dolgin Engineering features integrated battery plates that support the JVC and third-party BN-VF823 battery. This battery is used with JVC's GY-HM100U, GY-HM150U, and GY-HMZ1U cameras. The TC200 has semi-independent channels and allocates more power to the battery that needs it the most first. Once battery levels are equal it charges both batteries simultaneously with equal power distribution. The result is that all batteries will be ready at the same time. Based on a capacity of 5600mAh, this particular model delivers a complete charge in approximately 2.5 hours to a single battery or both. The charger comes with a U.S. power cord and supports worldwide power input via optional plug adapters, as well as 12VDC car lighter power via an optional car lighter adapter (model # DE_CAR_12). Box Dimensions (LxWxH) 9.8 x 7.0 x 2.95"